Two years have passed since Paul Kersey (Charles Bronson) last visited and cleaned up New York. He is back in Los Angeles, the president of his own successful architectural firm. Now a rich man, he has retired from killing criminals, though he still has dreams where he shoots muggers in parking garages. Paul has a new girlfriend, journalist Karen Sheldon (Kay Lenz). When Karen’s teenage daughter, Erica (Dana Barron), dies of a cocaine overdose, it’s time for Paul to get his gun out of storage and blow away a drug dealer. Shortly after shooting that drug dealer, Paul finds a note on his front porch. “I know who you are,” it reads. Paul then gets a call from a mysterious man (John P. Ryan) who identifies himself as being a reclusive millionaire named Nathan White. Nathan explains that his daughter also died of a cocaine overdose. He wants to hire Paul to take out not just the drug dealers but also the men behind the dealers, the bosses. Using his vast resources, Nathan has prepared a file on every major drug operation in Los Angeles. He offers to share the information with Paul. “I’ll need a few days to think about it,” Paul says but we all know he’s going to accept Nathan’s offer just as surely as we know that Nathan White has an ulterior motive that won’t be revealed until the movie’s final twenty minutes. For the first time, Paul is no longer just targeting muggers and other street criminals. This time, Paul is going after the guys in charge and trying to bring an end to drug trade once and for all. (The idea that the best way to win the war on drugs was just to kill anyone involved in the drug trade was a very popular one in the late 80s.) L.A.’s two major drug cartels are led by Ed Zacharias (Perry Lopez) and the Romero Brothers (Mike Moroff and Dan Ferro). Along with their own activities, Paul and Young work the turn the two cartels against each other. It’s not just the criminals that have changed in Death Wish 4. Paul has changed, too. Paul used to just shoot criminals and run away. In Death Wish 4, he gets more creative. He sneaks into Zacharias’s mansion and bugs the phone so that he can keep track of what’s going down. When it comes time to kill a table full of drug dealers (one of whom is played by Danny Trejo), Paul doesn’t shoot them up. Instead, he sends them a bottle of champagne that explodes when they open it. By the end of the movie, Paul is blowing away the bad guys with a grenade launcher! How many former conscientious objectors can brag about that? The biggest difference between Death Wish 4 and the films that came before it is the absence of director Michael Winner. Winner and Bronson had a falling out following Death Wish 3 and, as a result, Winner had little interest in returning to the franchise. Instead, Winner was replaced by J. Lee Thompson, who had already directed Bronson in several other Cannon films. As a result, Death Wish 4 is less “heavy” than the previous Death Wish films. Whereas Winner’s direction often felt mean-spirited and exploitive, Thompson plays up the film’s sense of airy adventure. Though it barely made a profit at the box office and has been dismissed by critics, Death Wish 4 is an enjoyable chapter in Paul’s story. If you’re looking for mindless 80s mayhem, Death Wish 4 gets the job done with admirable efficiency. It would have made a great ending for the franchise but Bronson would return to the role one last time. Tomorrow: Death Wish V: The Face of Death! Hamlet is a film of firsts. It was the first British production to win the Oscar for Best Picture. In winning, it beat out three American films (Johnny Belinda, The Snake Pit, and The Treasure of the Sierra Madre) and one other British film (The Red Shoes). It was also the first adaptation of Shakespeare to win Best Picture. Of course, it wasn’t the first Shakespeare adaptation to be nominated. That honor would go to 1935’s A Midsummer Night’s Dream. Adaptations of Romeo and Juliet would be nominated in 1936, 1961, and 1968. Henry V (which, like Hamlet, was directed by and starred Laurence Olivier) was a 1946 nominee. Then there was 1953’s Julius Caesar. The Dresser featured scenes from Shakespeare. Shakespeare in Love imagined the circumstances behind the writing of Romeo and Juliet. However, Hamlet was the first to win. It also remains the only traditional Shakespearean adaptation to win. West Side Story updated Romeo and Juliet while Shakespeare in Love … well, let’s just not get into it. It was the first Best Picture winner to be directed by the man starring in the movie. Laurence Olivier was nominated for both Best Director and Best Actor. He lost the directing Oscar to John Huston but he won for his performance as Hamlet. In winning, he became the first actor to direct himself to an Oscar. Finally, Hamlet was the first of 24 films to feature both Peter Cushing and Christopher Lee! In fact, this was Lee’s film debut. Now, before anyone gets too excited, I should point out that Cushing and Lee don’t actually interact. In fact, Lee doesn’t even speak in the film. He appears in the background as a Spear Carrier and it’s pretty much impossible to spot him. He has no dialogue and wasn’t even listed in the final credits. From what I’ve read, I don’t think Lee and Cushing even knew each other at the time and, when they later met, they were surprised to learn that they had both appeared in the film. For his part, Cushing plays Osiric, the courtier who everyone remembers because he had such a cool name. It’s always fun to play “what if.” Rosencrantz and Guildenstern do not appear in Olivier’s adaptation of the play. To modern audiences, that might seem strange but, really, that’s just because we’re all familiar with the two characters from Tom Stoppard’s Rosencrantz and Guildenstern Are Dead. When Olivier filmed Hamlet, he excised portions of the play in the interest of time. (Hamlet uncut runs over four hours. Olivier’s version clocks in at nearly three.) Rosencrantz, Guildenstern, Fortinbras, and the second gravedigger are all dropped from Olivier’s version and, to be honest, none of them are particularly missed. And yet … as I watched Hamlet, I found myself wondering what would have happened if Olivier had kept Rosencrantz and Guildenstern around and had cast Cushing and Lee in those roles. It probably wouldn’t have happened, of course. Cushing maybe but Lee was a total unknown at the time. Still, how amazing would that have been? As for the actual film, Olivier’s Hamlet turned out to be far more cinematic than I was anticipating. Olivier’s camera snakes through the darkened hallways of Elsinore Castle while Olivier’s Hamlet veers between self-righteous fury and apparent madness as he seeks revenge on his Uncle Claudius (Basil Sydney). As Hamlet grows more obsessed with death and vengeance, the castle seems to grow darker and the hallways even more maze-like, as if the castle’s changing shape to conform with the turmoil in Hamlet’s mind. Among the cast, Jean Simmons is poignantly fragile as Ophelia while Eileen Herlie is the perfect Gertrude, despite being 12 years younger than the actor playing her son. Olivier gives a wonderfully physical performance as Hamlet, killing Polonious with a demented gleam in his eye and literally leaping towards his uncle at the end of the film. If you’re one of those people who thinks that Shakespeare is boring … well, Olivier’s Hamlet probably won’t change your mind. One thing I’ve noticed about the “Shakespeare is boring” crowd is that nothing can change their minds. But, for the rest of us, Olivier’s Hamlet is an exciting adaptation of Shakespeare’s more difficult play. You won’t miss Rosencrantz and Guildenstern at all. And seriously, Fortinbras who? Yesterday, veteran British film director Lewis Gilbert passed away. Gilbert directed several films, in all sorts of different genres, but he’s probably best known for directing three James Bond films, including The Spy Who Loved Me. Since The Spy Who Loved Me is one of my favorite Bond films, I thought it would be appropriate to pick Carly Simon’s theme song, Nobody Does It Better, for today’s music video of the day. However, the closest that I could find to an “official” video was the Maurice Binder-designed title sequence from The Spy Who Loved Me. Written by Marvin Hamlisch and Carole Bayer Sager, Nobody Does It Better was Carly Simon’s longest-charted hit and it’s a song that has continued to have a long life outside of the Bond franchise. It was the second Bond theme song to be nominated for Best Original Song. Who Didn’t Fantasize About “My Entire High School Sinking Into The Sea” ? 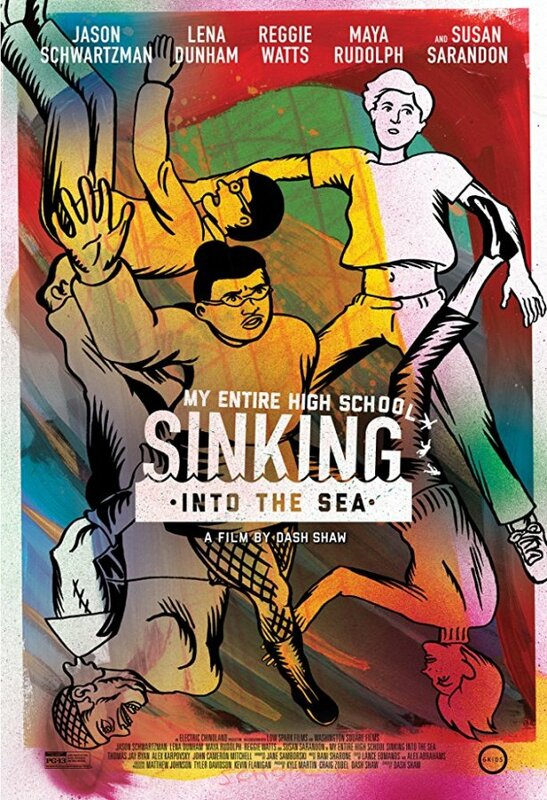 No metaphor or hyperbole here — cartoonist Dash Shaw’s 2016 cinematic debut, My Entire High School Sinking Into The Sea, is an indie animated feature that’s about exactly what its title claims. And what kid, present or former, didn’t dream about precisely that happening to their high school at least once?